A few months ago I walked away from the faith that had defined my very existence for over 30 years. It was such a relief. Of course every change brings its own set of questions. Of all the questions that have been raised due to this change the one that has nagged at me the most has to do with labels. To understand why this question bothers me so much I have to give a little background here. During my days in Christianity I carried around dozens of labels. Of course the big one was 'Christian', but there were lots of others. I carried one based on my denominational affiliation. I carried others based on which side I took on any number of theological issues. I carried each of them proudly. Each was a badge of honor to let others know exactly what I believed and stood for. Yet as I look back I am saddened to realize that all those labels completely obscured the person behind them. The amount of people that actually knew anything about me that wasn't somehow associated with my labels was minuscule, even among my fellow 'brothers and sisters in Christ' who had known me most of my life. I must admit that is all I really knew about the vast majority of them too. The saddest part is that is what we wanted others to see. That is exactly what we wanted to define us, and it did. If we were to have a definition of ex-Christian it would probably be something like: a person who is not a Christian but was at one time. 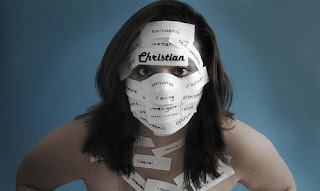 As I went through the long process of de-conversion I started to hate the labels even before I completely left my faith behind. I started to hate them because it finally occurred to me that the labels I so adamantly put forth could never truly help anyone get to know the real me. As a matter of fact more often than not the labels gave people the wrong idea about who I was. Take the one I carried the most proudly back then. Christian. That means different things even among others who carry the same label. The mere fact there are more denominations than I care to count among Christianity means christians themselves are not on the same page when it comes to what that word means. So how could that label have properly conveyed to someone else who I was when it didn't mean the same thing to them as it did to me? It's the same thing with all labels. They are totally subjective. Every person assigns their own baggage to any of them. Back to my current dilemma. I realize there are certain labels that we are born with. We can't help it. They are simply true by genetics. I am a white male. There are two labels right there that I simply cannot escape. However, I abhor the thought of assigning any to myself that are optional. For me that means any label that is not a result of genetics. If we were to have a definition of ex-Christian it would probably be something like: a person who is not a Christian but was at one time. According to the definition I am without a doubt an ex-Christian. But the fact is when we see or hear a word like ex-Christian we don't assign a clinical definition to it. There would probably be varying degrees of differences between each of us if we were to sit down and explain what that word means to us. Our experiences in life pack lots of personal baggage into any word that can be used a label. So whether it's ex-Christian, atheist, or any other I don't want it. I'm not embarrassed by them. I'm not mad about them. I just feel that any of them hinder others from getting to know me and not the person they think I am because of preconceived notions about the labels I may choose to carry. Heres where the dilemma comes about. You would be surprised how uncomfortable it makes the people around you when you refuse to label yourself, especially your religious beliefs or lack thereof. I'm caught between a rock and a hard place. I want others to get to know the real me so I refuse to label myself. However the refusal also keeps them from getting to know me because apparently it scares people to death to try and get to know another person without the help of labels to pigeon hole them. Anyone else been through this? If so I would welcome suggestions on how to get others to look past the lack of labels.